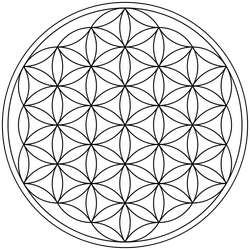 "The sacred geometric pattern The Flower of Life is said to contain the blueprints of creation as it emerged from the "Great Void". Another notable example of that which may be derived from the Flower of Life is the Tree of Life. This has been an important symbol of sacred geometry for many people from various religious backgrounds. visualization techniques for spiritual unfoldment. " Ilana Sobo, Ayurvedic Practitioner, Hatha Yoga Instructor, REiki Master, Community Herbalist, Artist and doting mom of a very active 8 year old boy. To learn more about Ayurveda, please visit ayurveda.com . The Ayurvedic Institute in Albuquerque founded by Dr. Vasant Lad. Here you will find many online resources, videos and more information on the ancient mother medicine of Ayurveda.